Now Bingo | Claim Your £30 Welcome Bonus Here! Claim Offer – Get £30 Bonus On 1st Deposit! Offer T&Cs: New players 18+ only | 300% match bingo bonus up to £120 on 1st dep, 30 days expiry | £10 min & £500 max dep | Wagering requirements (4x Bingo) & T&Cs apply. Now Bingo is one of the latest sites to launch on the Live Bingo Network and features superb Cozy Games Software. 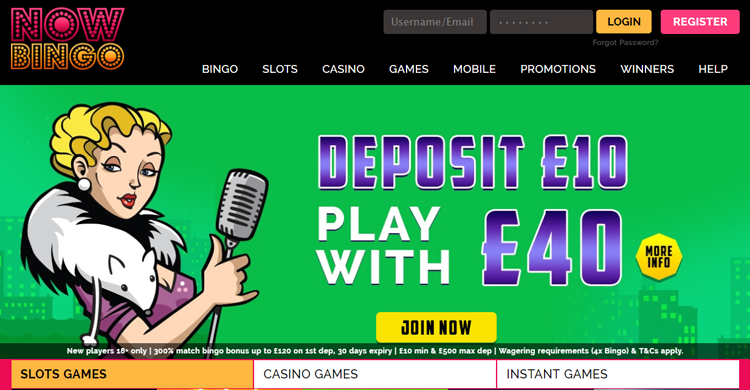 That being said, clearly, the best reason to sign-up and get started is that you will receive 7 days of bingo games access completely free with no deposit needed. Simply fill out the registration form, verify your details and away you go with 12 free tickets to every game in the Newbie Room. Another reason to join includes the lucrative welcome bonus package which entitles you to 550% of bonuses over your first 3 deposits. The largest bonus is the first, which gives you 300% extra, meaning if you fund your account with just £10, you will get £40 to play with. Enjoy free bingo games during your first seven days. Now Bingo uses Cozy Games software, who are a top-notch developer based in the Isle Of Man. The software powers over 100 different sites, as such you can rest assured that it’s a fully tested platform, featuring awesome games and great stability. You will find bingo, casino, slots and scratchcards on the site. Bingo is, of course, the main focus, and you will find everything from 30 ball speed bingo, to traditional 90 ball bingo. You can play some games for free during your first week, but most games are paid. Ticket prices start from a penny, plus you will find plenty of daily, weekly and monthly jackpots. Daily jackpot games dish out £1,000, whereas larger monthly games give a £4,000 prize pot. If slots are your thing, you will find a large library of fun, well-known titles, including Fluffy Favourites, Irish Luck and Big Ben. The casino games section isn’t the largest you will find, however, there are some great classics such as Roulette and Blackjack to enjoy. Now Bingo is fully mobile compatible, working on virtually any modern smartphone or tablet device. Unlike many of the other sites featured on My Town Bingo, this brand doesn’t require you to download in order to play from your mobile phone. All you need to do is head over to www.nowbingo.com, log in with your account details and start playing. Both Android and iOS devices are catered for, so if you have an iPhone or iPad you will easily be allowed to play here. There are 4x bingo wagering requirements. Now Bingo is fully licensed and regulated by the UK Gambling Commission. Withdrawal is not permitted until you fund your account with real money. There are plenty of social media deals. There is 24/7 live chat support if you have any queries. Now Bingo is a superb online bingo site that launched in 2016. Undoubtedly, the best reason to get started is the 7 days of free bingo with no deposit required. This welcome promotion provides a risk-free way to play bingo before you decide to add any funds to your account. We are also confident you will enjoy the actual site. The design is sleek and modern and registering is a super easy process. The games themselves are fun to play and the chat rooms are bustling. One benefit of being part of a large network is that the promotions tend to be rewarding, this is the case with this brand. Not only do you get a great 300% first deposit bonus but there are frequent monthly promotions that dish out value continuously. All things considered, this bingo website is definitely worth a look.